Hartford Homes "Garfield" floor plan is one of 3 model homes (Not For Sale) in Harvest Village. 6 plans priced from $314,950. 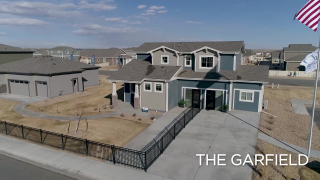 Open floor plans with modern finishes, standard features such as oversized garages, SS appliances, front yard landscaping, granite counters in kitchen and more! Plenty of design options incl bsmts & 3 car garages. Move in ready homes available! Ask about Bldr & Preferred lender incentives! Models Open Mon-Thurs, Sat 11-6 and Fri and Sun 12-6. VA discounts available.